While people still talk about hybrid cars like Toyota Prius, Honda has gone even longer. 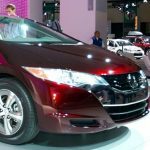 The Honda FCX Clarity offers own Home stations that can convert natural gas to electricity, heat and hydrogen to refuel fuel-cell vehicles. Maybe, in fact, a hydrogen car is the best choice! This car was launched in 2008 in the U.S., but unfortunately still we haven’t seen it in the rest of the world. This allows consumers to refuel vehicles with hydrogen at home, important until hydrogen stations become widespread. Alternatively, the hydrogen can be used in the HES’s built-in hydrogen fuel cell, providing up to 5 kW of normal or backup electricity and/or hot water for the home. According to Honda, this solution is highly efficient and reduces running costs of electricity, gas and vehicle fuel by up to 50%. Read more on Honda’s FCX page. The social robot Kirobo is back on earth!